After returning to Stagfell, it was time for a kingdom turn! The rulers continued to develop the southeast corner of the kingdom, building mines and farms, the latter of which brought their Consumption down to zero. Several towns, most notably Fort Heptamus (a renamed Fort Drelev), also got some love. Additionally, negotiations with House Orlovsky over buying enough griffon eggs and hiring the personnel needed to start a stable breeding program had been completed. 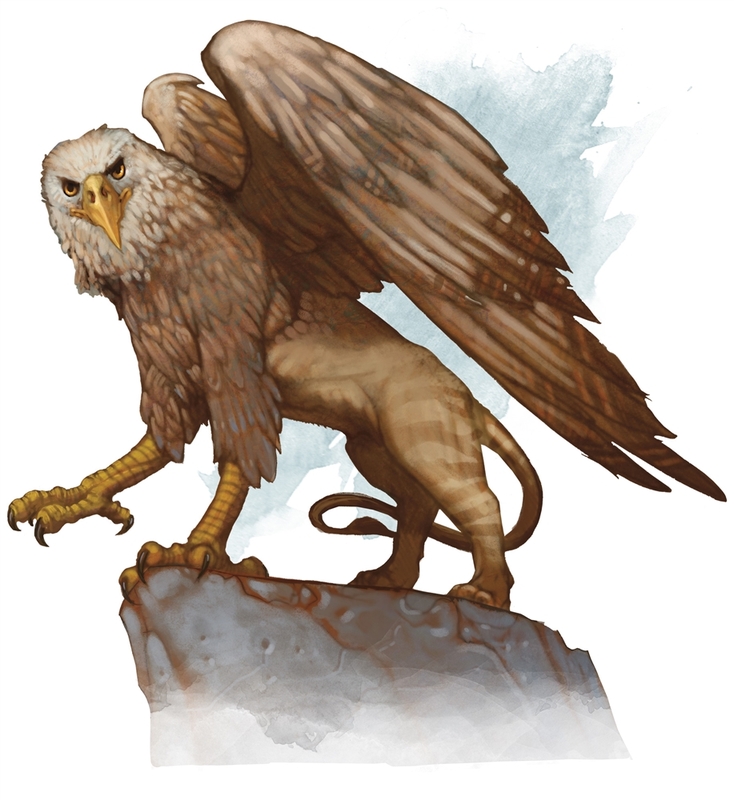 After paying the Orlovskys a cool 50 BP, the kingdom was able to officially open its griffon roost in Fort Heptamus. Although it would still take several years before Caerelia could field griffon-mounted army units. 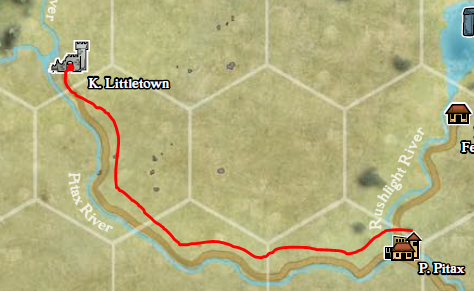 The rulers also sent out another group of mappers with an Exploration Edict, this time for a short jaunt into the northwestern block of darkness. That was Tiger Lord territory, are so in theory somewhat settled – though there were undoubtedly giants and worse among the highlands. Additionally, the Caerelians had received word from their allies and spies about the progress of the civil war in Brevoy. Rebel forces had managed to push west into central Brevoy, south of Eagle’s Watch, while loyalists raiders had invaded Orlovsky lands and were approaching Skywatch. Tiger Lord barbarians were rampaging through the southlands of loyalist House Lebeda. 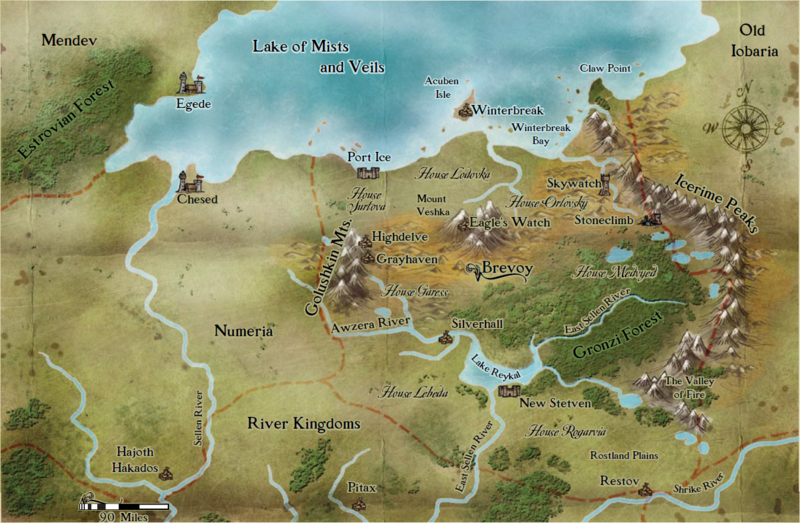 But it was said that the Regent was gathering warriors near Greyhaven, and to what end was unknown. Were they meant to defend against the rebel push? Would they attempt to retake the capital of New Stetven? Or was the intent to crush the Tiger Lords to the south? The other rebel factions were requesting more troops to guard the capital in case it was about to be attacked, and to free up their own forces. The PCs toyed with the idea of going off and fighting armies or tracking down the Regent, but Aakif the arcanist reminded them that they wanted both sides to grind it out and wear each other down. And so they decided to do nothing about the war at that time, though it should be noted that they already had two of their three big armies garrisoned in New Stetven. The party teleported outside of the city of Pitax, and flew on their magic carpet to Littletown, a… little town of farmers and vintners across the river from the forest. There they asked about local legends and such, and learned that the outer edges of the Thousand Voices were mostly safe, and there were some logging camps scattered around that part. But the region past the rivers was known to be the dominion of the faerie folk. Of the Castle of Knives, the farmers did not know much for certain, for it was said to lie deep in the Thousand Voices. But according to legend, the ruined castle only appeared at certain times, and no one who passed through the gateway ever returned. The “Mistress of Whispers” lived in the castle, and sometimes on dark nights she stalked the land, luring children who didn’t respect their elders and whatnot to their doom. The soft sounds one would hear in the Thousand Voices were the whispers of all the children she had kidnapped. oh ho! Perhaps something interesting shall happen when the PCs inadvertently stumble across the final dungeon a book too early! Haha! But the adventure does take that possibility into account. That would be just typical of PCs though!